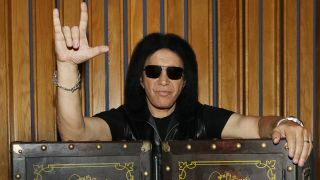 Gene Simmons has reiterated that he has no regrets over attempting to trademark the devil horns hand gesture used by rock and metal fans all over the world. The Kiss bassist came under fire from music fans, artists and Ronnie James Dio’s widow Wendy for the move to resister it as a trademark – with the application withdrawn two weeks after it had been filed in June this year. And in a new interview with Canada’s Metro, Simmons has added to his previous comments. He says: “You can’t please everybody. Not everybody likes Jesus, either. Instead of worrying what people think, I just go my merry way and do whatever I want to do. Last week, Simmons announced details of his solo box set titled The Vault, which contains 150 tracks, including never-before-released songs, photos, stories and collectible items. Simmons will hand deliver each package to customers at a designated location during his Vault World Tour which will take place between January and December 2018. Exclusive: Black Country Communion star in the new Classic Rock - Out Now!